at Waiouru Naval W/T Station – ZLO – which yielded QSLs from Radio Netherlands and HCJB. Not surprisingly XERF Del Rio, TX, could also be heard easily on MW. For this I have to thank another young telegraphist, Pat Baker, who had DX’ed Radio Leipzig in the late forties while still at college, and explained to me how one could get a QSL card and the possible bonus of a small souvenir in return for an accurate reception report. The late Peter Mulgrew, who was a Petty Officer Radio Tech at ZLO at that time suggested that Pat & I should study for our Amateur Radio qualifications, but having regular access to radios then, we didn’t follow up on his suggestion, in hindsight rather unwisely. Our Petty Officer of the Watch at the receiving station was a keen ham and on the 1am – 7am watch would sometimes talk the transmitter tech into letting him have the use of a spare transmitter with a Rhombic or Vee antenna attached for a couple of hours. When work conditions allowed the P.O. would let Pat and I have a go on the hambands – CW only – using his callsign. Great fun . But hard to convince some of our contacts in Europe and North Africa that we were operating within regulation power limits! Further SWL was deferred by periods of seagoing service, until I returned to Waiouru as a civilian in 1954 and sent a few reports from my trusty Pye domestic MW/SW receiver to Radio Australia. During a posting to Australia in the late 50s-early 60s, a colleague who happened to be a ham encouraged me to sit for my Amateur Radio ticket, and also helped me convert a surplus ARC-5 receiver to AC supply and add an extra IF stage for using on the 40m band. Sporadic CW-only ham activity (as VK3LL, ZL2ARY, ZL2BCH/VE3) continued until about 1995 by when the attraction of Amateur Radio was diminishing due to concerns about EM radiation and my declining CW capabilities. On moving to Levin in 1994 following retirement I became involved with the Radio Reading Service, which was subsequently approached by Dr Adrian Peterson to broadcast typewritten transcripts of Wavescan occupying about 20 minutes of airtime. 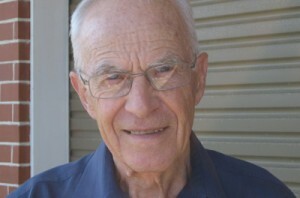 It was then, through the good offices of Peter Grenfell, Paul Ormandy, and other stalwarts of the North Otago Radio Club, who originally supplied material to fill the 10-minute gap in the RRS program, that involvement in SWL became much more a part of my life – for which I am most grateful. I spent a few years at HMNZS Irirangi at Waiouru, on and off from 68 to 75. Then joined NZPO and worked at ZLB and ZLC from 75 to 89. Also knew Wilbur quite well, and a number of the civvy operators as well.